Send an email to all members about a course or workshop. We will send you a confirmation message once your email has been sent to our members. We use Constant Contact for emailing. This complies with all data regulations for email advertising, such as allowing people to opt out. 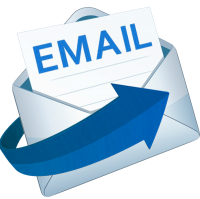 We can set the email up so that when people hit REPLY their email goes directly to you. In order for this to happen, Constant Contact would need to send a verification link to your email address, which you would need to click before the email goes out. If you do this, you will also get a full report on email performance, including number of people who recieved it, how many read it, how many clicked to go to your website, etc. The email will automatically be resent to anyone who does not open it after 4 days, though you can request we do not do this if you prefer. We typically send emails within 24 hours of payment, using the exact text you provide, though we will add a little basic artwork and layout to make it look professional. However, if you want the email to be sent at a specific time or date, we can preschedule this as well. In general, you get a better response rate if emails are sent on a Sunday night, as people tend to read more emails on a Monday morning than any other time of day. If your website uses Google Analytics for measurement, we can include tracking code so that Google Analytics can report how many people came to your site from the email and when they looked at when they got there.